Ilya Kovalchuk is a Russian professional ice hockey left winger currently playing for SKA Saint Petersburg of the Kontinental Hockey League (KHL). He debuted in the Russian Super League (RSL) with Spartak Moscow, before continuing his career in the National Hockey League (NHL). time in goals per game average. He is the 5th highest scoring Russian in NHL history. Kovalchuk won his first medals with Russia in a major international event at the IIHF World U18 Championships, earning silver and gold medals in 2000 and 2001, respectively. Kovalchuk made his senior international debut with Russia at the 2002 Winter Olympics in Salt Lake City, during his rookie NHL season with the Atlanta Thrashers. He also played for Russia in 2010 Winter Olympics. He will play as a forward for Russia in 2014 Winter Olympics. participation of men's teams, and also female tournament (except final). Ice Arena places one more emphasis that the Olympic Games are hosted by Russia. The "Bolshoy" Ice Dome is part of the complex of facilities operated by the International Ice Hockey Federation (IIHF).The complex includes the «Bolshoy» Ice Dome, the “Shayba” Arena and a training rink. All Ice Hockey venues are located in close proximity to one other, providing maximum comfort for athletes and guests of the Games.The "Bolshoy" Ice Dome complex will have a capacity of 12,000 seats and will be covered by a dome. The design of the "Bolshoy" Ice Dome is based on the image of a frozen drop and will be principally silver once complete.After the Games, the "Bolshoy" Ice Dome will serve as an ultra-modern, world-class multi-purpose sports and entertainment center.The name of the Ice Dome highlights the characteristics of this sports venue. The "Bolshoy" will be one of the biggest Olympic venues for hosting events and will house the most popular sport of the Winter Olympics, ice hockey. Equally, the word "Bolshoy" is understandable and familiar to representatives of many different countries, evoking an instant association with Russia’s Bolshoy Theatre, the traditions of the Russian school of ballet, figure skating, ice hockey and other achievements of the biggest country in the world. Vyacheslav Alexandrovich Fetisov (born April 20, 1958, Moscow, Russia, U.S.S.R.), Russian hockey player who was regarded as one of the best defensemen in the history of the sport. As a member of the Soviet Olympic team in the 1980s, he won two gold medals and a silver. He was also a member of seven world championship teams (1978–79, 1981–84, and 1986). A left-handed shooter, Fetisov was recognized early as an outstanding defenseman. Fetisov’s Olympic career began as a member of the team that competed at the 1980 Olympic Games in Lake Placid, New York. There the favoured Soviet squad was upset 4–3 by a young American team that they had defeated 10–3 in an exhibition game less than a week before the Games. Fetisov and his teammates settled for silver medals in 1980, but at the 1984 Olympics in Sarajevo, Yugoslavia (now in Bosnia and Herzegovina), the Soviet Union swept all seven of its games en route to Fetisov’s first gold medal. At the 1988 Olympics in Calgary, Alberta, Canada, his team was slightly less dominant but still gained the gold. Viacheslav Fetisov is the Russian hockey legend. At the 1956 Winter Olympics in Cortina d'Ampezzo, Italy, the Soviet team went undefeated and won its first gold medal. Ice hockey tournament at the Winter Olympics in 1956 was played among 10 teams in two stages. At the first stage contenders divided into three groups Group A consisted of teams of Canada, the United Team of Germany, Italy and Austria. Group B teams were Czechoslovakia, the United States and Poland, in the third Group there were teams of the USSR , Sweden and Switzerland. Two of the strongest teams from each group were to meet further in the final round. The Olympic Games allowed the USSR team to demonstrate that the Russians were instantly the new power in amateur hockey. 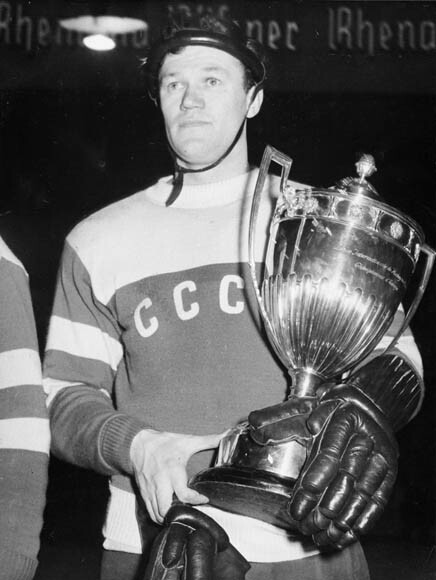 The Soviets, wearing their now-unfamiliar blue jerseys with the white V stripe, had Nikolai Puchkov in goal, the great tandem of Nikolai Sologubov and Ivan Tregubov on defense with high scoring Aleksei Guryshev, and Yevgeni Babichbut make no mistake, this team was led by the great Vsevolod Bobrov. Alexander Ovechkin was born on September 17th, 1985 in Moscow, Russia. He is a professional hockey player and the captain of the Washington Capitals of the National Hockey League (NHL). Before playing in the NHL, Ovechkin played for HC Dynamo Moscow of the Russian Superleague for four seasons from 2001 until 2005 and he played for Dynamo again but for the Continental Hockey League during the 2012-2013 NHL lockout. In the 2010 Winter Olympics, Ovechkin and Russian Team were one of the favourites to win the Gold Medal. Despite high expectations, Russia lost to Canada 7–3 in the quarterfinals. Ovechkin finished with 2 goals and 2 assists in Russia's four games. On July 6, 2009, Ovechkin was named an ambassador for the 2014 Winter Olympics in Sochi, Russia. Russian national hockey team at the Olympic Games 2014. Popov, Alexander Radulov, Vladimir Tarasenko, Alexei Tereshchenko. Defenders: Anton Belov, Vyacheslav Voinov, Alexei Emelin, Andrei Markov, Evgeny Medvedev, Ilya Nikulin, Nikita Nikitin, Fedor Tyutin. Goalkeepers: Sergei Bobrovsky, Semyon Varlamov, Alexander Yeryomenko. For Team Russia, the Sochi games are their chance to prove to the world that Russian hockey deserves its place on the world stage. On top of regular Olympic home team pressure, the Russians are eager to prove that their national league, the KHL, produces a product worthy of competing with North American hockey. January 14, 1948 - August 27, 1981. He was a star ice hockey player from the Soviet Union and was considered one of the greatest players in the world. Kharlamov gained international recognition when he led his national team to the Gold Medal at the 1972 Winter Olympics. At the 1976 Winter Olympics, he scored the game-winning goal in the final game to earn his second Olympic gold medal. In addition to his three Olympic medals (two golds and a silver (in 1980, Lake Placid)), Kharlamov also won eight World Championships (1969-71, 1973-75, 1978-79) and six European Championship (1969, 1970, 1973-75, 1979). He also won silvers (1972, 1976) and bronze (1977) at the World Championships and silvers (1971, 1972, 1976, 1978) and bronze (1977) at the European Championships. While the origins of ice hockey are still hotly debated, it is thought that the modern form of the game was taken to North America by the English. The first game of ice hockey was played between soldiers stationed in the Canadian province of Nova Scotia. In 1879 students at McGill University established the first rules for the game and organized ice hockey competitions.The first official men’s international ice hockey tournament at the Olympic Games was held in 1920.Women's ice hockey has been included in the Olympic Games program since 1998.In the Olympic Winter Games program, there are separate ice hockey competitions for men and women. Two sets of medals are contested. One of the first «stars» of the Soviet hockey, the Olympic champion Vsevolod Bobrov, was first a famous football player. The first tournament in ice hockey in the Olympic Games was held at the Summer Olympics in 1920 . Since 1924, hockey moved to the Winter Olympic Games . Tournament ice hockey women's teams included in the Olympic program with the Winter Olympics in Nagano in 1998 . Between 1920 and 1968 World Cup Hockey held in the Olympic Games . Since 1984, the NHL players were allowed to participate in the Olympics, but the League has enabled her to play for hockey players at the Olympics only since 1998 , making this a "window" in the calendar of matches of the regular season . In the entire history of the Olympic Games became the owner of 7 gold medals. Still managed to take away five collecting medals smaller advantage . This teams from Switzerland, Germany and Finland , Russia and Czechoslovakia. The greatest number of titles won the USSR and Canada ( 7 wins) . The greatest number of medals managed to win the Canadian hockey players - 13. Adam David Vernon Foote (born July 10, 1971) is a retired Canadian professional ice hockey defenceman. He was best known for his physical presence and gritty play as a stay-at-home defenceman. Foote was drafted out of the Ontario Hockey League (OHL) 22nd overall in the 1989 NHL Entry Draft by the Quebec Nordiques. He began his NHL career with Quebec in 1991–92 before relocating with the franchise to Colorado, where he won two Stanley Cups in 1996 and 2001. In 2005, Foote signed with the Columbus Blue Jackets where he served as team captain for three seasons. served as team captain for three seasons.